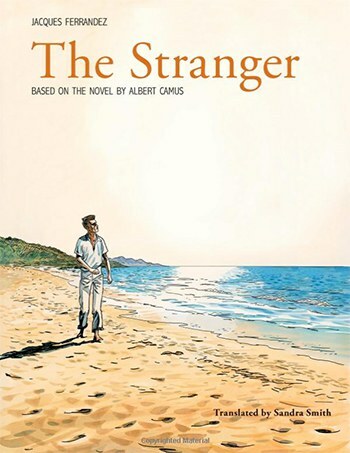 Jacques Ferrandez's graphic novel adaptation of Albert Camus's The Stranger is a surprising salve for grown-ups. When every literary corner of the earth turned up the volume to praise Kamel Daoud’s debut and eventually New York Times best-selling novel, The Meursault Investigation, riffing on cult classic The Stranger by Albert Camus, did you read it? Me neither. I loved The Stranger when I first read it in high school. Many young people latch on to the story of Meursault’s senseless crime as an allegory for the blankness of youth itself. Then those teens grow up into adults who perhaps branch out into reading on absurdism, nihilism or existentialism. These grown-ups have precious few artifacts on which to rest their weary feelings, so The Stranger has a magic that is hard to touch and that needs no accoutrement. To mess with it by making subsequent art works in response to it requires the heaviest lifting. I skipped The Meursault Investigation because it seemed too derivative of the relationship between Jane Austen and Jean Rhys, between Jane Eyre and Wide Sargasso Sea. I read both books in undergrad and hated the latter, not for its presumptuousness but for the frustration of injecting so much history into what was once a tight little allegory. Postcolonialism is very interesting to me, just like feminism and queer studies is, and I like to see the canon brought down wherever possible most of the time. But I suppose I am too bound up in continuing to love Jane Eyre and The Stranger to appreciate articulate, well-intentioned, interesting riffs on them. For whatever has happened in my life, with all its bigness and smallness, over the past year since Daoud’s novel debuted, I felt compelled to pick up Jacques Ferrandez’s graphic novel version of The Stranger. Maybe the US presidential election cycle is getting to me. Maybe I just became one year older and equally wiser. Maybe it was the idea of the pictures. It’s an absurd, unaccountable contradiction that I would jump at this one when I didn’t jump at the last one. And there are really only these two efforts to respond to that magnificent little story by Camus, so we might be working our way toward flinging around adjectives like “definitive”. Because I wanted to see Algiers. Don’t you want to see Algiers? There are more than three million Arabs living in a metropolis built by Ottoman rule, rebuilt by French rule and finally by independence in 1962, looking out across the Mediterranean toward Spain, France and Italy from the foot of the tenth-largest country in the world. It was once home to Camus. I think if a reader wants to dig deeper into a beloved novel, a reader should begin looking into the author of it. This is why biographies of writers are so popular. There are allegedly clues to the masterwork in there. One’s art follows from one’s life, and one’s life is to some greater or lesser extent a matter of one’s location. In reading Ferrandez’s graphic novel, I quickly determined that the textual translation was very faithful. So, yes, go ahead and check that important box. As for boxes, not one page of the book has an unobstructed gridline of squares in a neat row. If the first row contains two big text boxes, then the next row has five little ones, so that the page becomes this jaggedly paced and kind of claustrophobic reading experience. I know that sounds negative; it’s a compliment if you enjoy Camus and respect that the page design can itself successfully perform absurdism. But I was surprised to find myself doing less reading and more tourism. I even went back to the book a second time just to look at the illustrations. The majority of the two-page spreads contain a big background image, generally in the upper half, usually at the left margin and sometimes centered. These are outside of the story in two ways. As far as content, they don’t depict the characters. Their whole function is to convey the city of Algiers. Neither is there text in these boxes, only the flat, shimmering bodies of an urban space teeming with life. As far as form, they differ dramatically in both scope and depth perceptions of the landscape’s sprawl, as well as assuming a different attitude from the boxes because the comparatively harsh black ink outlines of everything within the boxes has been dropped out. As opposed to the grueling sepia tones necessary to convey the sentiments of the narrative, Ferrandez treats these background landscapes more like watercolor paintings. They are straightforwardly loving portraits of his actual home city, relatively unburdened by the heavy vibe radiating from nearby text boxes. They are an anchor, there for context. The fervency with which I wanted to embrace Camus in my youth has been watered down a bit by Prufrockian coffee spoons. As adults, we know absurdity in the story of our own lives, where bad and strange things have happened. We begin to long not for the fiery temptation of random impulse, but for its salve, for a few minutes of peace and quiet. There's a tranquility that Ferrandez has inserted into The Stranger that was not in the original text. I may be too old now to profess faithfulness for The Stranger itself and instead find the background illustrations to be the best and most soothing part of the book. But is absurdism not meant to soothe us? No kidding; that’s its fundamental weakness as a matter of practical ontology. You can’t go around shooting mute, anonymous Arabs on the beach. 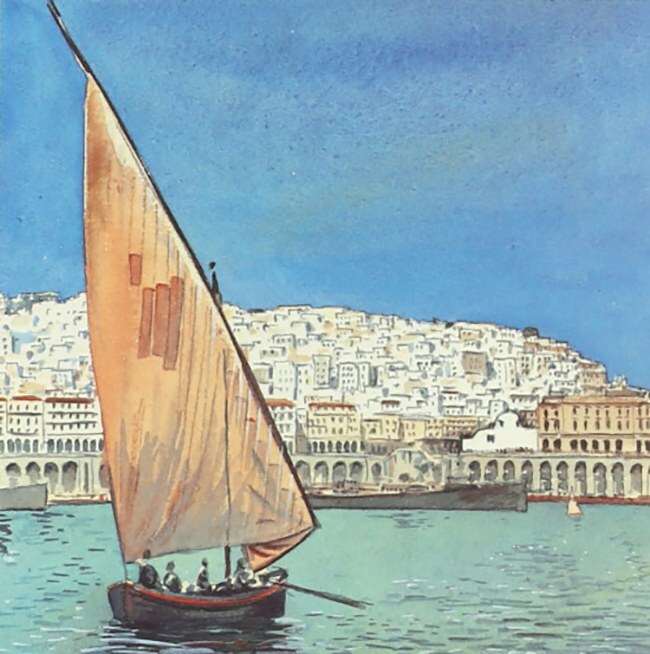 But you can sit outside your apartment for hours and do a really nice watercolor of a boat docked in the harbor, with your glass of wine in one hand and a cigarette in the other. Camus was dead at 47, so he was probably just on the cusp of growing weary of his own youthful ideas. Ferrandez is 60, and it shows wonderfully in his work here to great educational effect. Rhys was in her late 70s when she published Wide Sargasso Sea and Daoud is approaching 50. Perhaps I should go back (and therefore, forward) and take another look at them, too.